Have you had a chance to read Teabook, Part 1, a review of two Teabook teas? The founder of Teabook, Jeffrey McIntosh, spoke with me last week about his start in tea and future plans for the company. I'm pleased to share our Q&A below. Please note that the answers are a mix of verbatim transcription and my paraphrasing. Notes on Tea: Before receiving my teabook I envisioned a tea bag chest that you sometimes see at an afternoon tea service. The design of Teabook is a bit like that. Can you talk about the design of the “book” as well as the inspiration for company’s name? Jeffrey McIntosh: Teabook is the third tea company that I have opened. I lived and studied in China and am fluent in Chinese. I wanted to make quality tea accessible. People in the US find it hard to integrate tea into everyday life. With Teabook, people can have access to and get new tea every month; pure loose leaf tea. They can say, "Wow, tea tastes great on its own!" The main friction points for potential teal drinkers are (1) temperature; (2) leaf to water ratio; and (3) steep time. 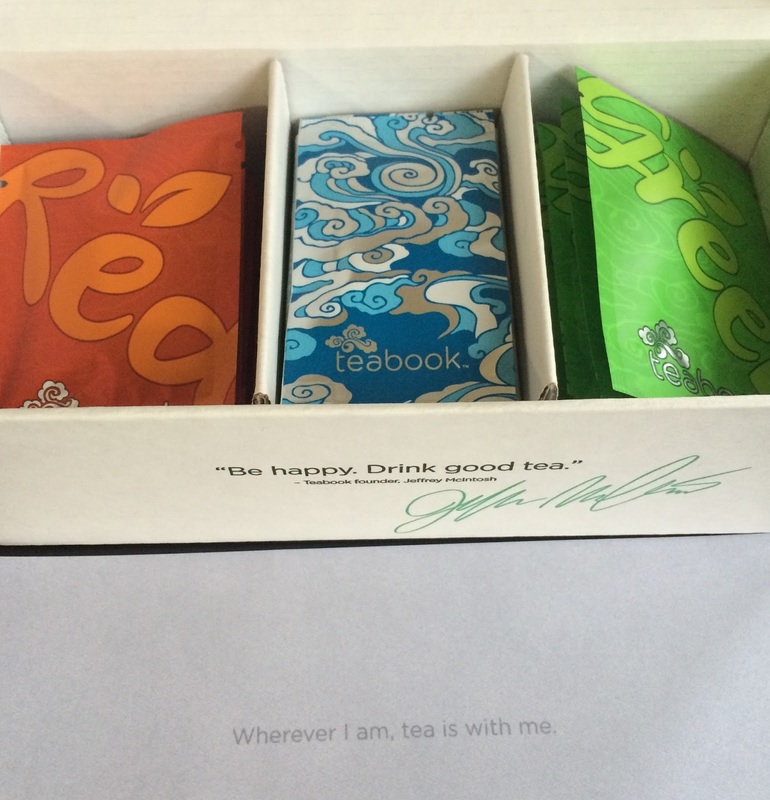 The Teabook concept addresses all three. Green, white, oolong, red, and a special tea will be offered. The inclusion of a special collection tea is to provide an ultra premium tea experience. The tea bags are designed to open across the top cleanly so there will be a nice pour. The minimalist box design is a nod to low cost production as well as to modern design aesthetic. 87% of millennial are drinking tea; this demographic is pushing the demand. The company is incorporated as Xian Chan Tea Corporation but we decided not to use this name for the product because it is difficult to type and we wanted to appeal to a broader audience. The name Teabook evokes a narrative, a journey; the more you interact with the company and its teas, the more you learn. My husband said that your tumbler reminds him of seeing office workers in China drinking tea from mason jars. Was this imagery the inspiration for your tumbler? Did you have concerns about oversteeping since the leaves remain in the tumbler? The tea tumbler design originated with a tumbler producer in China. We did not want to use plastic so we altered the design to a double-walled glass body. The filter is stainless steel and durable but other components of the lid are plastic. In the next iteration of the tumbler, it will be a plastic exterior with a glass interior, and no plastic in the drinking experience. We were concerned about oversteeping only on red tea but we think most people will drink the tea before the liquor reaches this point. You can steep the green tea for an hour without overstepping. There is 1-2 grams of tea in each pack and the tumbler holds 10 ounces of water. We are working on making the portions more precise. If you experience a plastic taste, the tumbler can be washed in very hot water and it is dishwasher safe. In your bio, your “hands-on tea farm experience in China and modern large American tea company know-how” are mentioned. Can you describe both experiences in more detail? When I was 17, I walked into a small teashop in Seattle and drank a high mountain oolong. This cup of tea was literally life changing. I felt a weight lift from my shoulders and I realized that this -- holding a cup of tea in my hands -- was what I wanted to be doing. I dropped out of school and started an internship at the teashop. Through the Seattle teashop owner, I met an Los Angeles based tea master and owner of the Denong Tea Company. I completed an eight-month apprenticeship in Yunnan dos studied with her for one year in L.A. After that, I traveled between L.A. and China two to three times per year. During this time, I fell in love with puree. The first tea company I founded focused on puree and the majority of my clients were based in Russia. The mission of Teabook is really clean tea that tastes good and is affordable, then we will introduce teaware and other aspects. My biggest fear is that tea will become a beverage industry. Why a subscription service model and not a traditional tea seller? I know that the subscription or curated model is hugely popular as a result of my studies at the Founder's Institute, the largest incubator in the world. We designed our subscription experience to provide a little window into the tea world every month. It is flexible in terms of commitment because we did not want the customer to feel trapped. People can go in and create account. The interface is one page and it is easy to submit an order. I’ve noticed that many of the new tea companies – whether subscription services or tea sellers are located in the Pacific NW (Washington, Portland, Vancouver). Can you talk about your locational decision? I don't know. A lot of beverages start ups have come out of Seattle and the Pacific Northwest (PNW). Maybe it is the cold weather, the rain. It's possible that large Chinese populations in Seattle and the PNW might be a contributing factor. I read that the teas you will offer are based on “the season’s best”. Can you give a preview of what a subscriber might expect in each month’s box over the course of 12 months? A new website will be launched this month. A white tea is coming soon. Next month, the box will have an oolong and a green tea and we will increase to 19 packets (9 packets each of the two regular teas, and 1 packet of the special collection tea). In the winter we will provide roasted oolong and black tea. Next year we want to introduce puerh but there is a washing aspect which we are working through. We may offer puerh through the special collection along with rock tea and Wuxi teas. Look for new quotes in the January box. We will begin to feature farmers’ gardens. Also, we are developing videos; starting in January, a video will be released every month. Finally, next year, customers will be able to customize their teabook box. How will you maintain "seasonal offerings" with a customization option? We will keep the choice of tea simple by type so a subscriber can’t ask for a Bi Lo Chun “out of season”, for example. Also there might be a month or so when green teas would not be included in a teabook even if a subscriber requested all greens in her box. Is sustainability a core element of Teabook? Sustainability is important but I am focused on validating the concept. At 10,000 + subscribers, all packages will have to be biodegradable. The first element that we would make sustainable is the tea packets. We have found a supplier in the U.S.
Jeffrey McIntosh is the founder and CEO of Teabook. Thank you for taking the time to speak with me, Jeffrey.